China's world famous ancient capital Beijing has a history dating back more than 3,000 years, with more than 860 years as the seat of the national government. Home to more Unesco World Heritage Sites than any other city on earth, Beijing has a rich imperial style and a distinctly Chinese character - part of the reason it ranks as one of the world's most influential cities. 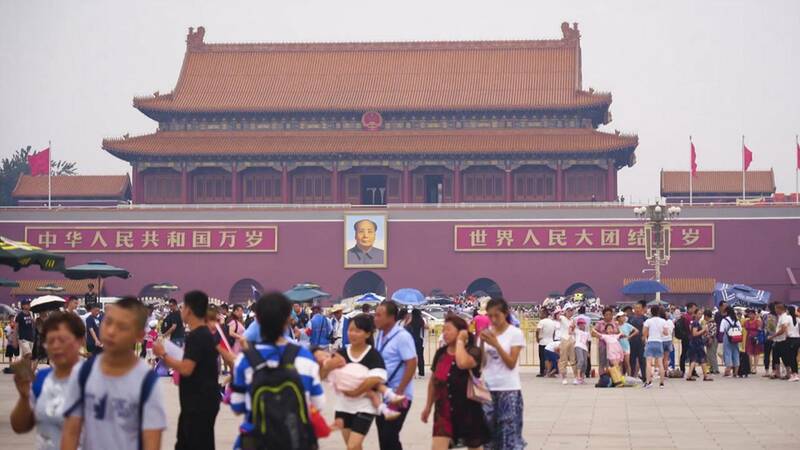 Situated in the centre of Beijing and south of the Forbidden City, Tian'anmen stands on Chang'an Avenue opposite Tian'anmen Square, the Monument to the People's Heroes, the Mausoleum of Mao Zedong, the Great Hall of the People and the National Museum of China. This extensive area, which covers some 440,000 square metres, is known for both its aesthetic and political significance. Tian'anmen Square is one of the most emblematic places in Beijing and a part of what is known as the Central Axis of the Capital. Lying at the core of Beijing's spatially symetrical old city, the Central Axis and surrounding areas form a masterpiece of ancient and contemporary urban planning. Its design reveals how the Chinese people applied science, aesthetics and ancient philosophy into the construction of their capital city. Ever since it was chosen as the nation's capital, Beijing has consistently amazed visitors with its buildings and complexes along the Central Axis. The axis is the backbone of Beijing and gives the city a sense of peace and prosperity. The Central Axis runs from south to north; the buildings in the east and the west were constructed along the axis in a symmetrical pattern and a royal architectural order. Walking through Beijing can feel like travelling through time -- and the journey from one century to the next can often be taken by turning a corner. Within the last few decades, Beijing has transformed into one of the most modern, dynamic, and global cities in the world. Its landmarks include the monumental Olympic Park and Bird's Nest Stadium. The size of the Bird's Nest is striking but more impressive is its unprecedented design. Envisioned as the iconic centerpiece for the Beijing Olympics, the National Stadium is an architectural expression of China’s pride and burgeoning confidence. The stadium is at the north end of the Central Axis and is the symbol of the new super modern Beijing. "The 2008 Olympic Games held in Beijing spread the Olympic culture, promoted the Olympic spirit, enriched the meaning of the Olympic Games, and promoted the healthy and sustainable development of the Games, says Xu Tao, spokesperson for the National Stadium. "It has also maximised the educational function of the Olympic Games and achieved the Game's lofty goals. The impact is far reaching, irreplaceable and positive." Since the closing ceremony of the 2008 Games, the Bird’s Nest has become a huge tourist attraction. Now the Chinese capital is preparing for the 2022 Winter Olympic Games and is set to become the first city in history to stage both Summer and Winter Olympics. The Great Wall of China, one of the wonders of the medieval world and a UNESCO World Heritage Site, is the largest man-made structure ever built. The Great Wall is not only a triumph of engineering but also a direct link to the legendary emperors of China's past. The Great Wall is more than just a building complex. It's also an exquisite masterpiece of stone art left over from the Ming Dynasty. Standing on the Great Wall in all seasons you can see the extending Yanshan Mountain and large areas of maple trees, a reminder of the glory of ancient China. The Mutianyu section of the Wall has a charming and unique structure. What makes it even more special are the three watchtowers open to visitors. The Chinese government has made the protection and restoration of the Wall a priority and in 2006 promulgated the Great Wall of Protection Ordinance. Taking care of this immense monument takes a lot of work. '’We have a lot of visitors every year and the tiles have been damaged," says Luo Xing, Deputy General Manager at Beijing's Mutianyu Great Wall. "We use traditional methods to repair the Wall and protect its cultural relics. We have specific standards for making replacement bricks and floor tiles. We even use traditional techniques for that."